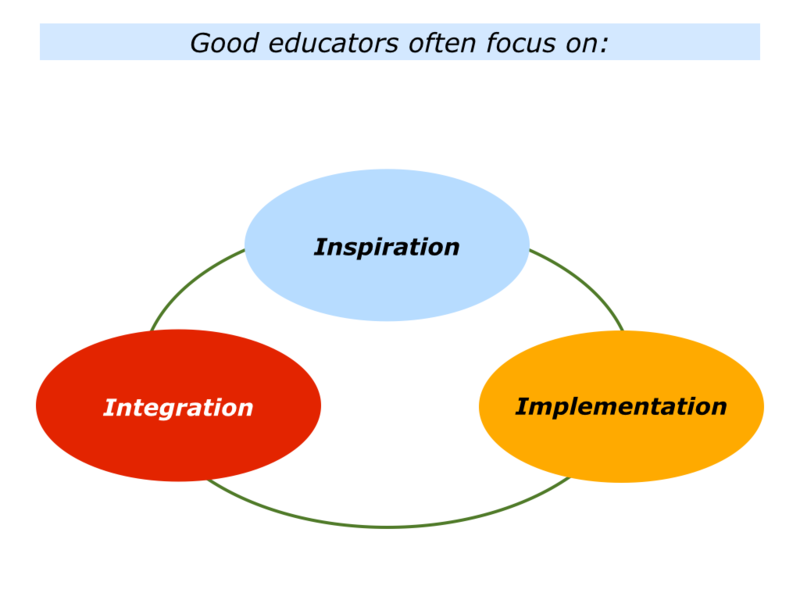 Good educators focus on the 3 Is: inspiration, implementation and integration. They create an inspiring environment, provide implementation tools that work and enable people to integrate the learning in their own ways. Good educators start by creating an inspiring environment in which motivated people can learn. They show enthusiasm for their subject and link the learning to people’s lives. Whenever possible, they make the sessions enjoyable and effective. They then encourage, educate and enable people to achieve ongoing success. Before running the actual educational session, however, they do whatever they can to set it up to succeed. You will have your own approach to making this happen. 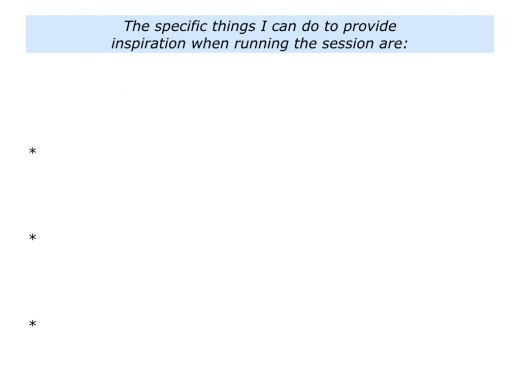 Here are some things it can be useful to do before running a session. Imagine that you are going to run an educational session for motivated people. It will obviously be important to clarify the specific things that people want to take away from the session. Clear contracting is crucial in any relationship, especially if you are supplying a service to other people. 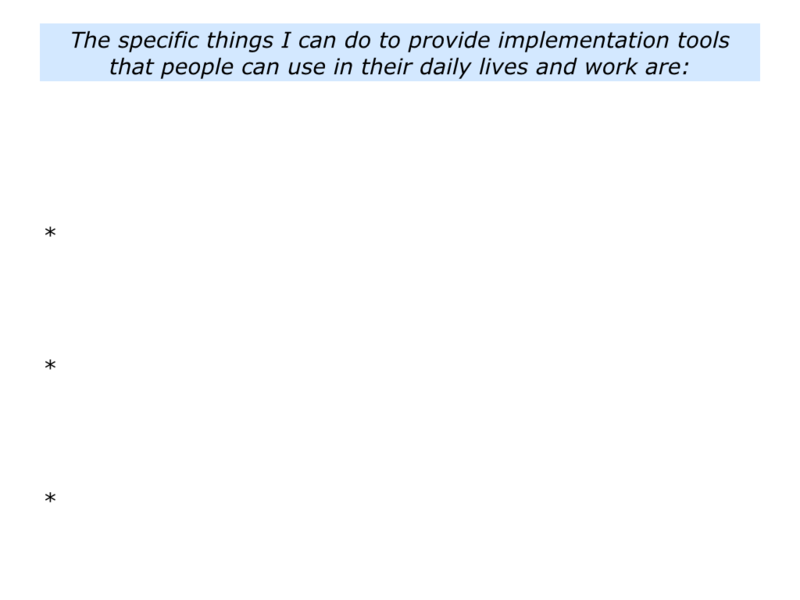 So it can be useful to talk with the key stakeholders beforehand and ask some of the following questions. Bearing the answers in mind, play back your understanding regarding the goals for the session. Make sure everybody is agreed on the desired outcomes. Good educators continue to be encouraging, but they also explain what they can offer and can’t offer to help people to reach their goals. To clarify their picture of success. To build on their strengths, whilst managing the consequences of any weaknesses. To pursue practical strategies and perform superb work. Good educators also make clear contracts about their own and other people’s responsibilities in working towards achieving the goals. So they often say the following things before the session. Good educators focus on doing everything possible to set up the session to succeed. They do their best to make sure it will be held in physical and psychological environment that inspires people to do their best. Imagine you are going to run a session for learners. If you wish, try tackling the exercise regarding setting the scene for the session. This invites you to do the following things. 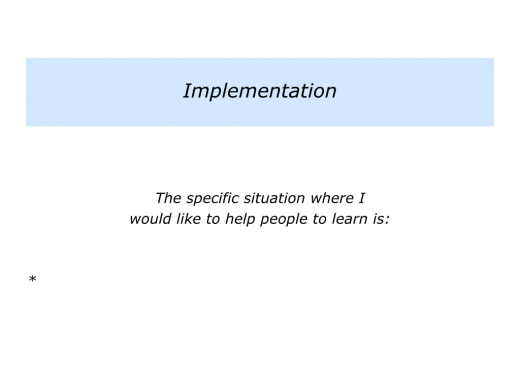 Describe the specific situation in which you would like to help people to learn. 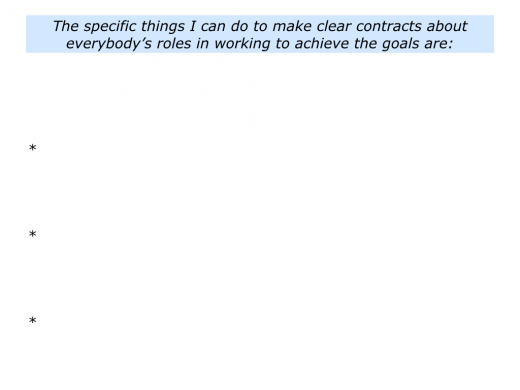 Describe the specific things you can do to make clear contracts with people about the specific goals to achieve in the session. 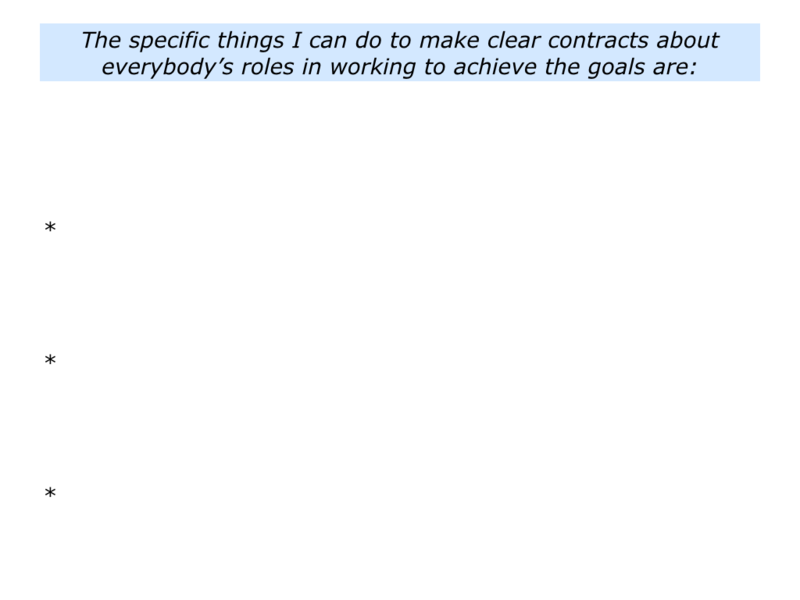 Describe the specific things you can do to make clear contracts about everybody’s roles in working towards achieving the specific goals. Describe the specific things you can do to do everything possible to set up the session to succeed. Good educators create an encouraging environment. They make sure all the physical and psychological things are in place to enable people to learn. Different educators do this in different ways. When I run workshops, for example, I ensure that the room has natural light, the chairs are comfortable and there is a plentiful supply of refreshments. It is then important to create an environment in which people feel able and ready to learn. Good educators then take some of the following steps to encourage, educate and enable people to develop. Good educators are enthusiastic. I saw this in action when visiting a top soccer club to meet their Head Coach. Before our one-to-one meeting he led a training session with the players and invited me to watch. Because of various commitments, there were only six players taking part, but the session was enjoyable and effective. 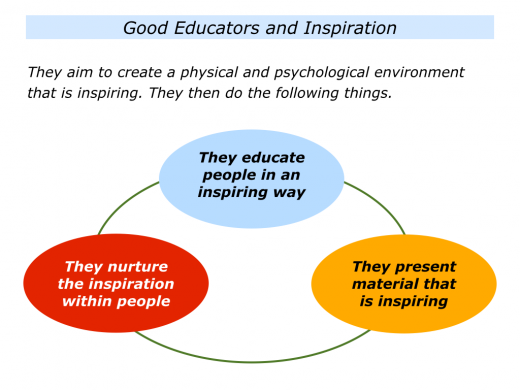 Good educators aim to pass on material – knowledge, tools and ideas – that is inspiring. They share information that will help people to succeed. Different educators use different models for making this happen. One approach is to focus on the 3 Ps. It is to make the learning personal, practical and profitable. Personal – the learning must relate to the person’s agenda and their world. Practical – the learning must be practical and provide tools the person can use in their daily life or work. Profitable – the learning must be in, in the widest sense, profitable and help the person to achieve their goals. Good educators believe in the old adage that ‘the learner learns what they learner wants to learn’. So they focus on what people feel inspired to learn. People are more likely to learn things that resonate with them and fit their agenda. So it is vital to provide learning that is real, relevant and rewarding. It is also vital to tap into the inspiration already within people. In my own work, for example, I start by clarifying people’s picture of success. I then tend to use the organic approach to development. This is based on following beliefs. People already have within them the seeds of development. People already have strengths and successful patterns that have used in the past to achieve their goals. People can be helped to build on these strengths and successful patterns – plus add other skills – to develop and achieve their goals. You will have your own way of focusing on inspiration. If you wish, try tackling the exercise on this theme. This invites to do the following things. 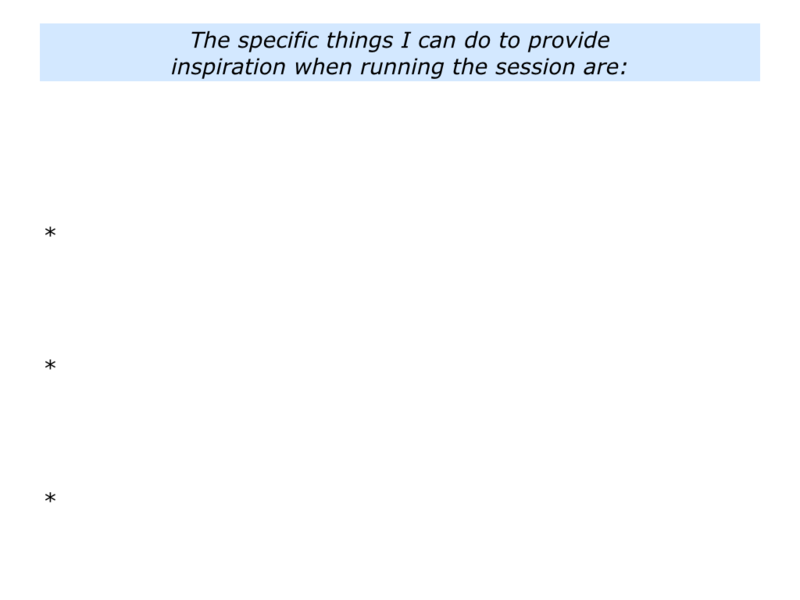 Describe the specific things you can do to provide inspiration when running the session. 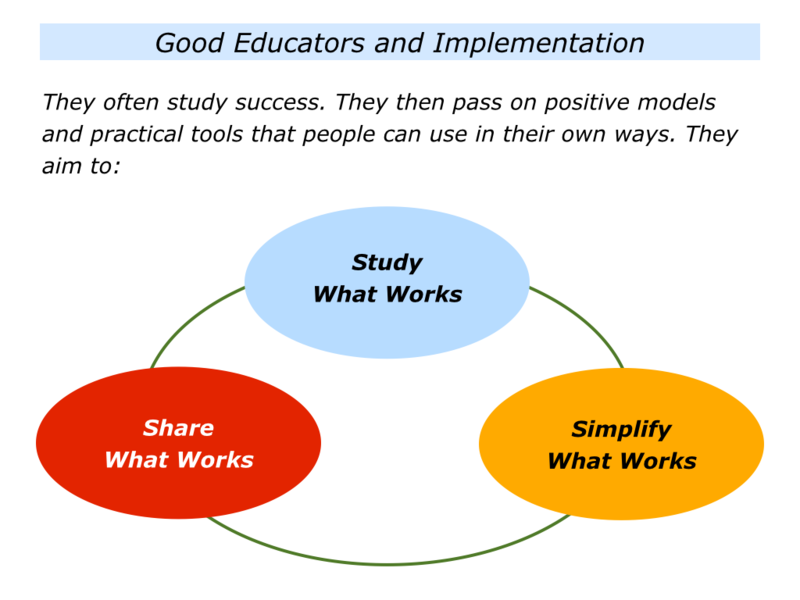 Good educators provide implementation tools that work. They are able to go from the philosophical to the practical, from the conceptual to the concrete. They provide knowledge, models and tools that people can use in their daily lives and work. How do they gather this information? They study what works, simplify what works – but in a profound way – and share what works. They then pass on this information in a way that enables people to achieve their goals. Such educators study success. They watch people, teams and organisations in action – or study examples of their work – and see what they do to succeed. They often take the following steps when studying and simplifying knowledge in a particular field. They focus on what people do right – the principles and patterns they follow – to succeed. They translate these principles into positive models that people can follow to succeed. Good coaches, for example, share this information in way that they person can use to reach their goals. They start by watching the person in action or studying examples of their work. What are they doing well? How can they do more of these things in the future? What can they do better in the future and how? What are the specific things they can do to reach their goals? What are the key messages I want to give the person? What are the positive models and practical tools I can share? How can I pass on this knowledge in a way they can accept and use to achieve their goals? The next stage is to invite people to test the tools in reality, just to make sure they work. If so, the tools are added to the repertoire of options that people can use to reach their goals. You will have your own way of providing implementation tools that work. If you wish, try tackling the exercise on this theme. This invites to do the following things. Describe the specific things you can do to provide implementation tools that work. Good educators help people to integrate the learning in their own ways. They encourage, educate and enable them to achieve ongoing success. A person needs to own the knowledge. They need to make it part of their own way of working towards achieving success. This applies whether they are developing skills in computing, cookery, creativity, dancing, engineering, economics, football or whatever. 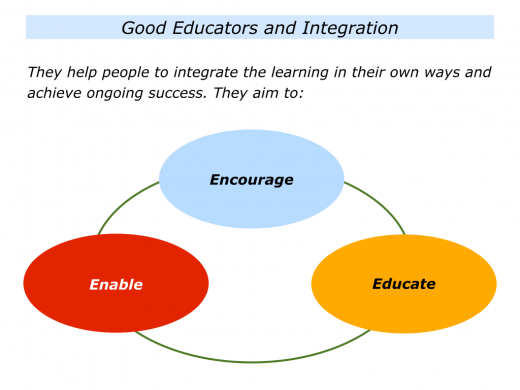 How can you help somebody to integrate a piece of learning? One approach is to invite somebody to go through the following steps. Some of these have been mentioned already. But it can be useful to go through these steps in depth to help the person to integrate the learning. To be crystal clear on the real results they want to achieve. To clarify the key strategies they can follow to do their best to achieve these results. To mentally rehearse going into the situation and pursuing the strategies – plus dealing with any specific challenges – on the way to achieving the desired results. The person then goes into the situation, applies the strategy or skill and aims to achieve the desired results. Encourage the person to share their self-evaluation. Explore how they can continue build on their strengths and, where appropriate, manage the consequences of any weaknesses. You can then, if you wish, pass on knowledge that they can use to achieve their goals. This brings us to the following step. You can share positive models and practical tools the person can use to achieve success. Again, you can do this in a way they person can accept and use to achieve their goals. How do you know when somebody has integrated an idea? They use their own language and methods to explain what they are doing to make things happen. Good educators often take people through the stages of inspiration, implementation and integration. You will, of course, do this in your own way. Describe the specific things you can do to help people to integrate the learning in their own ways.